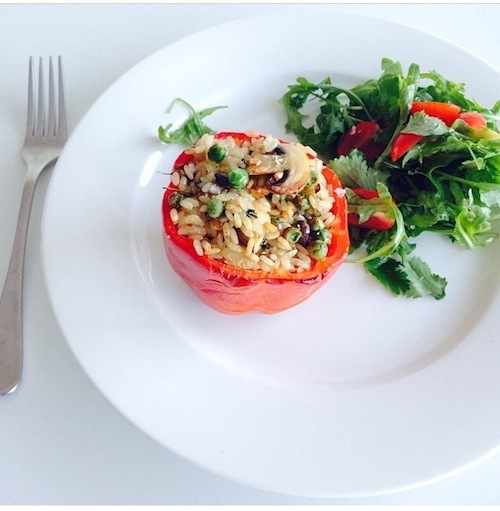 Good Food Friday: My Stuffed Capsicums and an announcement! Guess what? Many of you have been busting for the big announcement of dates for the next Gentle Body Cleanse. I’m delighted to reveal, the March Gentle Body Cleanse will kick off on March 17th! To secure your place, click on this link and if it sounds like it’s something your body is screaming for and need more info, get all the details of what’s involved here. If you’ve previously cleansed with me, the menu will be the same as our November Gentle Body Cleanse however your daily emails with new recipes will be this months new feature, meaning we will continue to grow your recipe library and what’s more, support you through the cleansing process. This means along with your 5 day menu plan, you will get an extra (and new) daily recipe to keep your taste-buds rocking along! In a fry pan, melt 1 generous tablespoon of coconut butter or olive oil. Add mushrooms and peas and stir until cooked. Add rice and season and cook for another 5 minutes, add thyme. Arrange capsicums on a baking tray, cup side up. Place rice mixture into each capsicum half. Drizzle with oil and place into the oven for 20 minutes or until capsicum is cooked. Hello. I really want to do the cleanse but I am away for work the week beginning the 17th so wouldn’t be able to do it then. Could I do it before or after? Is all the information required in the pdf we receive by email? Hi Nat, I just bought my ticket for the cleanse. I’ve never done a cleanse before (and am a little nervous about what to expect) but I loved ‘Fertilise Yourself’ and the other recipes you put up so I’m excited!! Is there a menu plan on the cleanse if you are vegetarian? I am keen to sign up for the cleanse but I am just wondering if the lunches are easy to prepare? With work I don’t have access to much for preparing food.